There’s a very early-stage NASA concept to take a submarine and dive into a lake of Titan, that moon of Saturn that has chemistry that could prove to be a similar precursor to what eventually formed life on Earth. The moon has weather and a hydrological system and an atmosphere, making it an exciting location for astrobiologists. Luckily for scientists, the Cassini spacecraft beams back regular updates on what it sees at Titan. And this week comes yet another opportunity, as the machine whizzes by the moon to look for “mirror-like surface echoes” in a lake-filled region in Titan’s northern sector. Principal among the targets will be Kraken Mare, a liquid hydrocarbon sea that is about five times the size of Lake Superior in North America. It’s an astounding 154,000 square miles (400,000 square kilometers). On this pass, Cassini is going to sail over the eastern area of the sea. “Measurements of the absolute strength of the echo and its polarization properties, when detectable, yield important information about the surface status (liquid/solid), surface reflectivity, surface dielectric constant and implied composition, and surface roughness,” Cassini’s website says in a description of the T-106 flyby, which will take place Thursday (Oct. 23). This is the second-to-last flyby Cassini will have of Titan in 2014, with the last one coming Dec. 10. 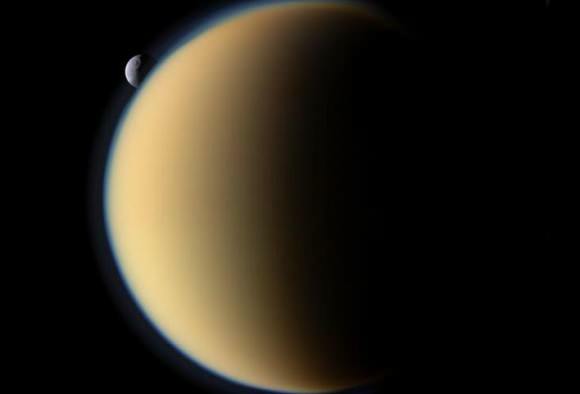 In that case, the focus will be learning more about Titan’s atmosphere to learn more about measurement differences obtained by instruments on Cassini. This past week, meanwhile, Titan has been busy looking at Saturn. It examined a northern aurora, looked at the planet’s F ring, and also searched for small satellites. Scientists have been working at Saturn for the past 10 years with the Cassini mission, which is now entering a new phase as Saturn enters northern summer. This is expected to produce more changes on Titan, such as winds picking up, as more sunlight strikes the surface and atmosphere.